Hello! It's finally what I like to call 'Christmas week', yay! Unfortunately I am still at work this week but come Friday I'll be free! 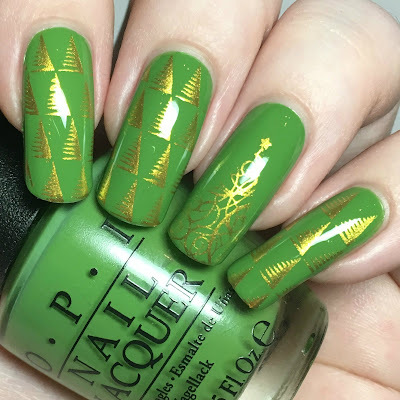 Today I have a Christmas tree mani to share with you, inspired by a similar one created by Bethany from BNailedToPerfection (see Bethany's mani here). I used the same stamping images as Bethany, but different polishes. Read on to find out more! I started with a base of OPI 'I'm Sooo Swamped', a grass green creme. It has a lovely smooth formula, and is easily opaque in two coats. 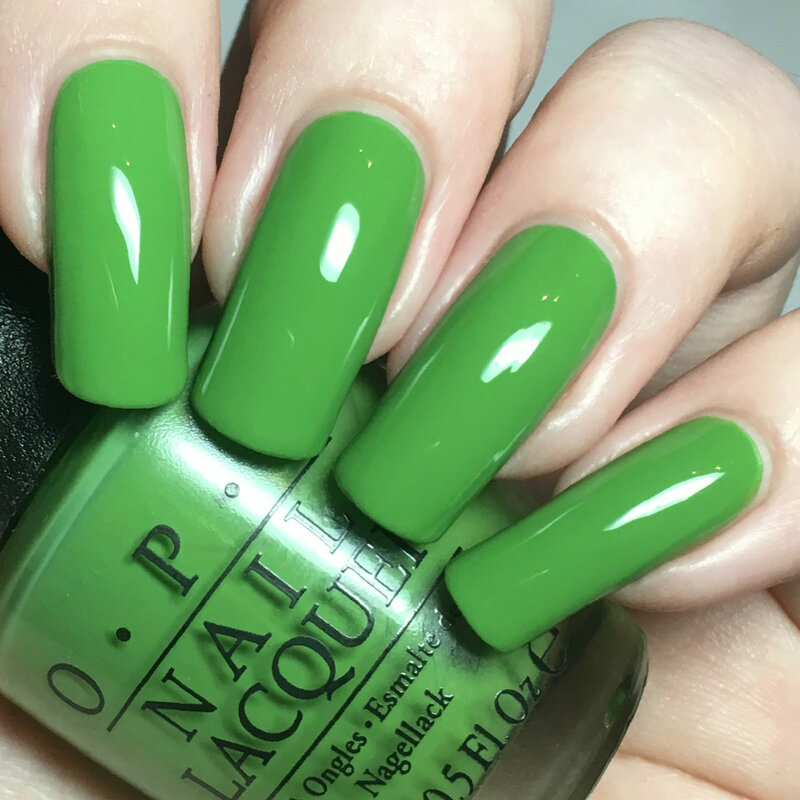 This is the only polish I picked up from OPI's Spring 2016 New Orleans collection - and honestly it was mainly because it reminds me of Shrek! Below is two coats and topcoat. To add my Christmas trees, I used two different images from Uberchic Beauty stamping plate Christmas-02 (purchased from Nail Artisan). I stamped the big tree image to my ring finger, and the multipe tree pattern to the rest of my nails. I used my Born Pretty Store clear stamper and scraper and their bright gold stamping polish, before finishing with topcoat. What do you think? I love how these came out! This is definitely one of my favourite Christmas mani's so far this year. I'm glad I chose a bright yellow gold to stamp as it really seems to pop off of the green base. Less than a week until the big day - eeeek! that green is lovely! can't beat a good OPI creme! Love that green and the trees are so cute! that cream is so luminous. 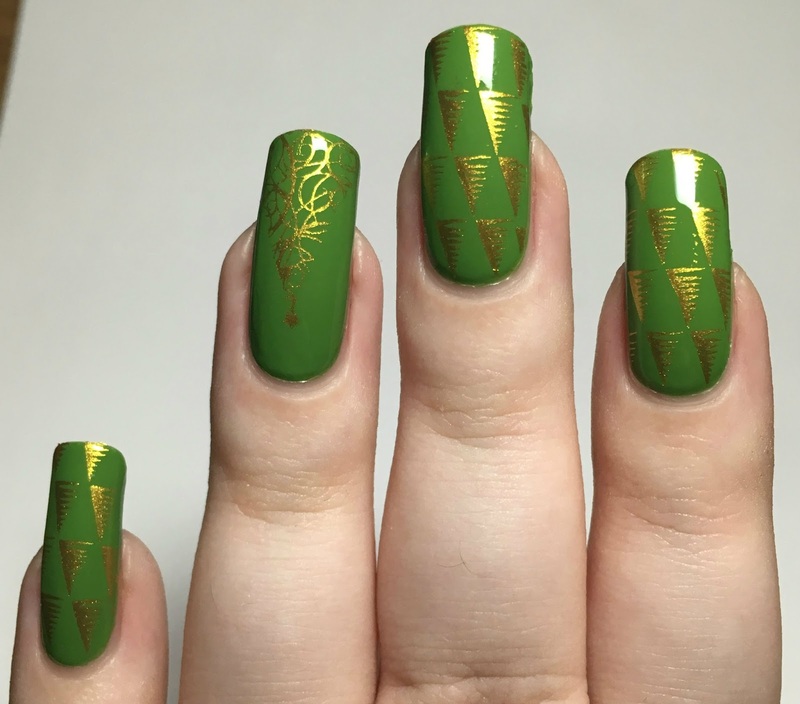 I love the green with the gold! love it ! so beautiful ! Nail twins! Well, sorta, I used the tree stamp on my mani today too! This is such an adorable mani! Love it! Your mani is so pretty. The green and gold combo gives me vintage, sixties vibes that bring back some great early memories. Love that shade of green. Pairs perfectly with your gold trees!! Green and gold pair nicely! <3 I love this! What a great mani! I love that you went with gold instead of the traditional red. That green is everything!! Everyone has been using such great greens this season. Green is lovely for sure. I have a slightly darker one. Your nails are always so long and gorgeous! I get serious nail envy. 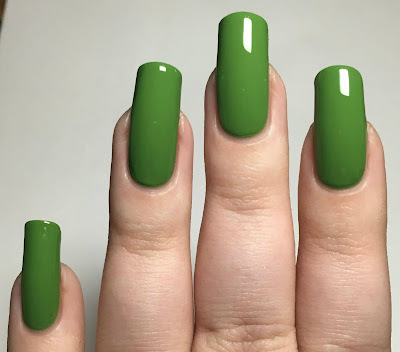 I love this green! Oh wow!!!! The color combo and stamping are perfect!!! I love how you used gold for the stamping plate -- really like the end results! This is such a pretty manicure!